Michelangelo Antonioni’s The Passenger - unimaginatively titled El Reportero in Spanish - is playing at Cinemes Meliès, Barcelona’s art house cinema. I just watched it yesterday and it is too fresh in my mind to properly critique. BUT, check it out if you can. Tomorrow is the last day it's showing at the cinema. Antonioni, I admit, has put me to sleep a couple of times, but The Passenger is truly a gem of a movie. Starring Jack Nicholson and featuring the artistry of Michelangelo Antonioni, this movie had me marveling the whole way through. From the deserts of northern Africa, to Munich, to the south of Spain, this is an existential movie par excellence, perfectly playing on the theme of rootlessness and identity. 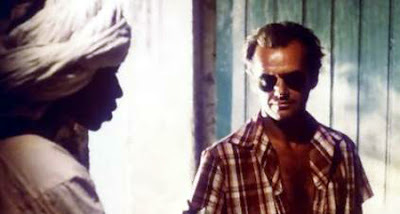 Jack Nicholson is a disillusioned reporter who decides to switch identities with a dead man. But, the new identity brings with it some serious baggage, and this leads to danger and romance and a fantastic conclusion in the remote and dusty regions of Almeria Spain. My only complaint would be the acting of the female lead, Maria Schneider. She needed a little chispa – or spark – as they say here in Spain. Nicholson, however, is awesome as always. A pleasant surprise for me was a twenty minute segment in Barcelona. The year is 1975 – that’s when old Francisco Franco kicked the bucket in case you didn’t know – and this is one of the best depictions of Barcelona I have seen on film. Of course there’s the Ramblas, the obligatory Gaudi architecture, Park Ciutadella ... but the great pre-EasyJet Barcelona is very palpable*. The trailer doesn’t do the movie justice, but just check out this amazing shot from near the end of the movie (in Almeria Spain). Cinemes Melies is a great – though slightly rundown – original version art house cinema in Barcelona. It’s also cheap at 4 euros a ticket. * One hilarious thing is that Spaniards are constantly arguing in Antonioni’s Spain. It’s definitely a Spanish quirk that I’ve noticed, and for an Italian to depict Spaniards as loud-mouthed arguers is quite something!